Intradermal skin testing is similar to prick testing, and it is performed using a 26- to 30-gauge (very thin) needle. A diluted allergen is injected below the skin surface and observed for 15 to 20 minutes. 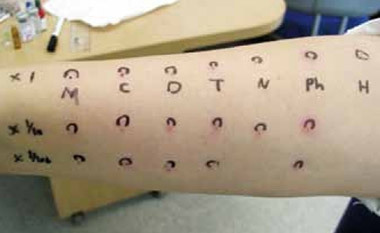 The “wheal”—a raised, red, itchy bump and surrounding “flare”—indicates the presence of the allergy antibody when the person is exposed to specific allergens. The larger the wheal and flare is, the greater the degree of the allergy.